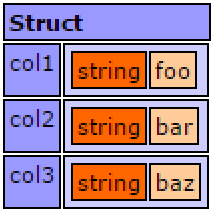 Query objects in Lucee are a powerful type of object that act a bit like an array, and a bit like a structure. It is the data type that Lucee returns SQL record sets into, and is also useful as a data structure for non SQL operations. 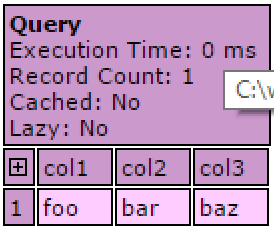 Lucee Query objects are created from SQL statements, the ORM, Other Query objects, Directory functions, HTTP requests, and more. 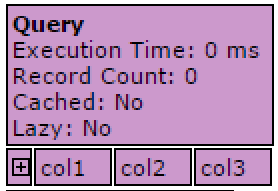 Query objects conceptually look and act like a database table, like a spreadsheet. They have columns and rows. In these examples, they will use a Query object created manually. 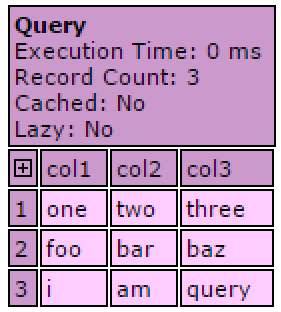 New rows can be appended onto the ends of query objects. The addRow() function takes data, as in this example, or it can be empty in which case it appends an empty row. In this dump we see that an additional column was added, but it also filled in the rows of previous columns which did not have any data. 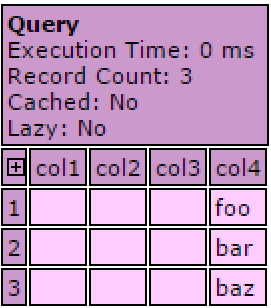 All of the query functions keep all of the columns & rows in sync. There are a few methods to loop over queries depending on what meta you may need from within the loop. The for [row] in [query] syntax returns the row data for each iteration of the loop, in a structure format. This method is very clean and straight forward when the intention is to loop over all rows, the only downside is the loop body does not have access to the loop increment count (the index), and it can&apos;t constrain to a maximum number of rows (without using a custom counter and break; to exit the loop). It also can&apos;t skip rows (for example, return every 5th record). The next looping style can do these things. This looping mechanism would allow limiting the total number of rows, or skipping rows. The loop tag is another method of looping over query objects and works a little differently from the preceeding two examples. With the loop tag, the tag body has variable which references the column of the particular row the loop is currently on. Thus by the echo(col1) that is implicitly returning the value from col1 for the current row of the loop. The example above which has 6 rows, but the startrow=2 and maxrows=2 are set, and so it only outputs those two rows.